Today was scattered around different tasks. We tested the repositioned Sound Beams, further refined the Constellation settings, picked off stragglers in need of verification – or RE-verification, and finally SIM’d the underwater speakers. First order of business was to find out what we had gained from moving the SB-2’s up 2 meters. 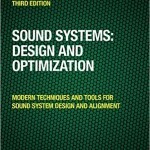 The answer: 6-8 dB, quite substantial and well worth the effort. The area with the most image distortion from the main arrays is “the beach” , the rows close to the water edge. These stand to benefit the most, vertically, from the SB-2’s contribution. The close seats have the lowest risk of hearing the unit directly behind them . By contrast, the high ground seats near the back need the SB-2’s the least, but carry the highest risk of experiencing distracting localization and pre-echo from the SB-2’s. And yet there is another layer at work once we get the full circle of crossed swords into play (all 8 SB-2’s). The rear seats have the highest amount of isolation – being in the pattern of only 2 of the SB-2’s (the one facing them and the one behind). Also in their favor is the front-back asymmetry of the human hearing system, which favors the front by virtue of our pinna. Sound is invisible. Highly directional devices are REALLY challenging to aim at a spot 130 ms away – even on a clear day. But there is NEVER a clear day in the shower right? Well our SB-2’s are behind a shower curtain so we could not do simple tasks like putting a laser on top and seeing where it goes. It goes a foot in front of the speaker. Great. So we have to measure it and find it, in order to verify that the 4 SB’s on the opoosite match the near side. This went ok for the most part – but #3 did not match its brother across the ocean. Different in 3 positions, and NOT making any sense in terms of angled down – or to the left etc. The culprit as it turned out: folds in the curtain. All but #3 and 4 had no folds in front of them. #3 abd 6 did – and they did not match. Where is the interior designer when you need him! Having completed our must-do list we could not resist the chance to measure the underwater monitor speakers. These 36 speakers are used to communicate to the divers, the swimmers and to play music to keep the swimmers on cue. The large quantity is due to the fact that the pool is a highly variable environment with lifts going up and down, bubbles, fountains, leaking oil wells – oh wait – no that is the Gulf of mexico – anyway LOTS OF STUFF GOING ON. So we put in a DPA hydrophone, plugged it into SIM and got a transfer function of some of the speakers in the water. VERY AMAZING! I have some plots which I will post when I get a chance. 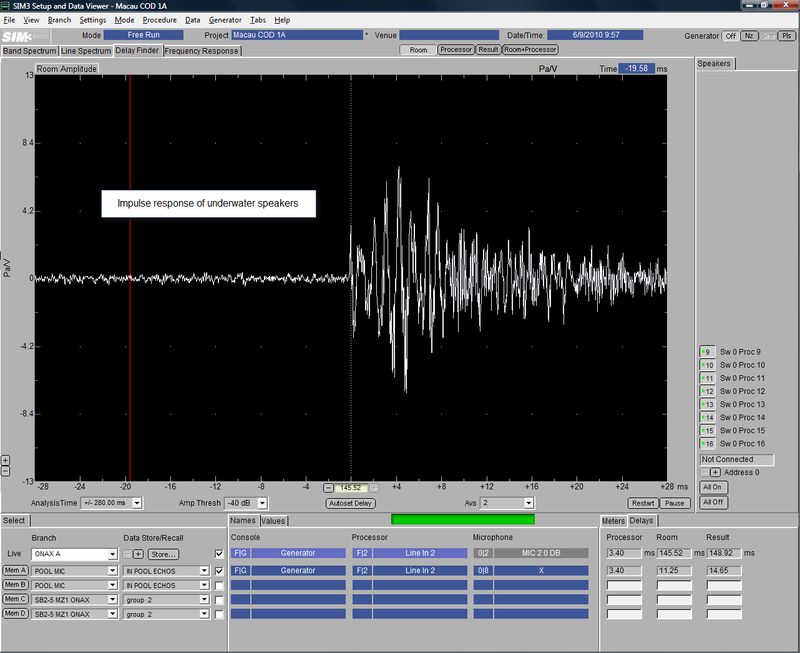 I have NEVER seen so many strong reflections – the impulse response looked like a 3 minute earthquake. 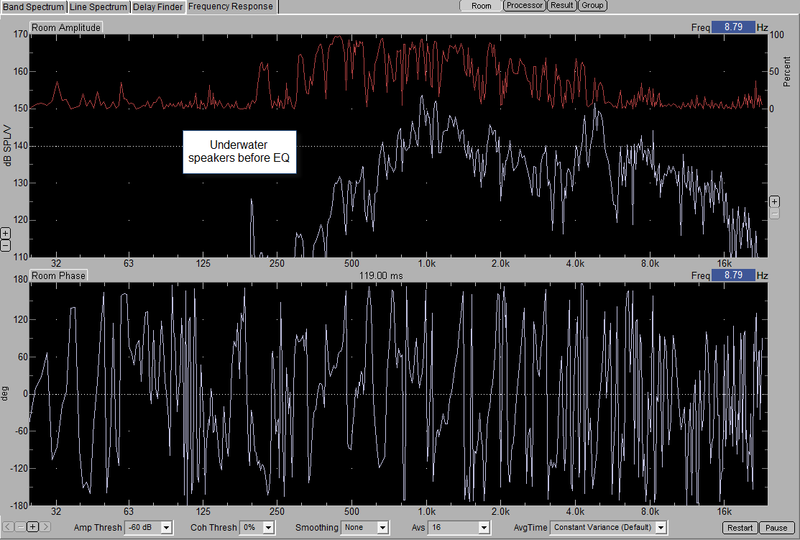 The freq response looked terrible – but it looked AMAZINGLY like the spec sheet for the product. We eq’d a bunch of different ones and even found one that was reverse polarity! When we were all done the next some folks got in the pool to listen. Quite cool. We have renamed it the SIMMING pool. 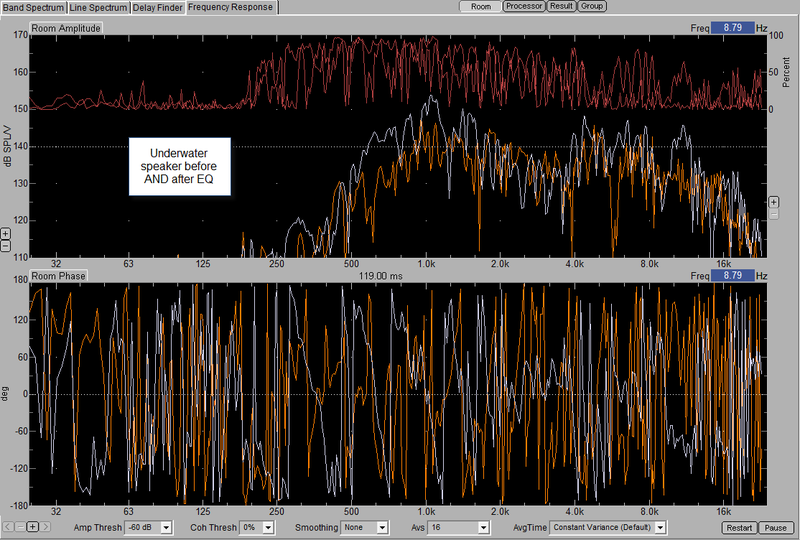 Here is some data from the underwater measurement and tuning. 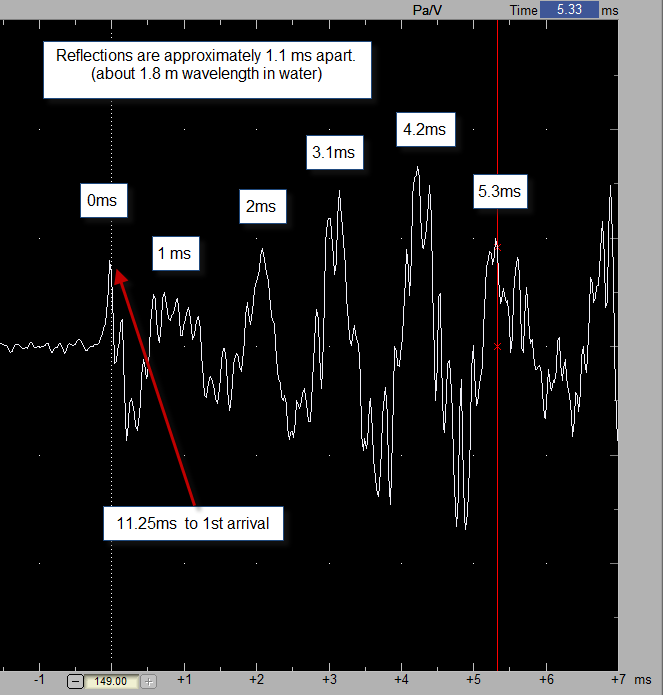 The impulse response is quite fascinating because the reflections were so much closer than I expected. I was thinking only of the reflections off the sidewalls and not so much of the floor and ceiling. The CEILING? Well in waterworld the H2O/Air interface is like a wall. Not much sound energy moves across that barrier and a LOT comes back down. This was pointed out to me by Dr. Roger Schwenke and the up/down bounce is very much in evidence in the impulse response. The density of the reflections is greater than I have ever seen for a set of speakers and their wall reflections. They are closely spaced roughly 1.1 ms – which is the same distance as 5ms in air, a wavelength of about 1.7m (5.5 ft). Above – impulse response of underwater speakers. First arrival is at 11.25 ms. 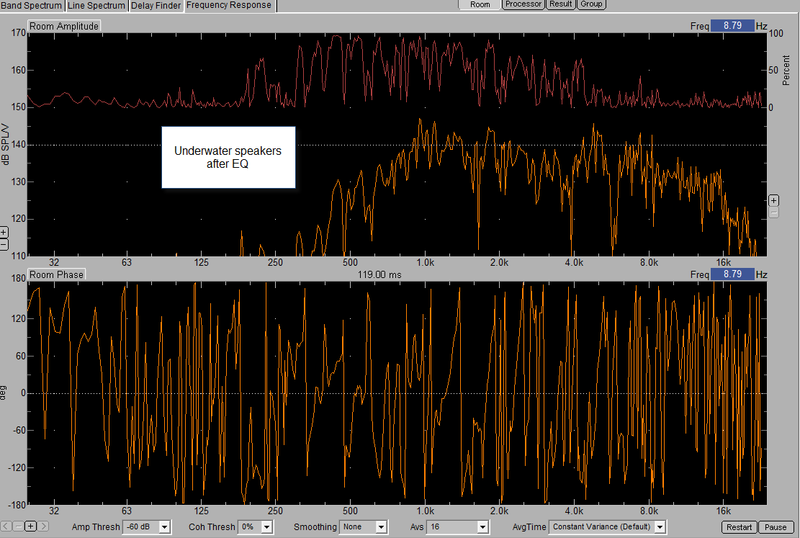 Here then is a freq response of the speaker(s). We did an initial eq at 890 Hz, the worst offender. 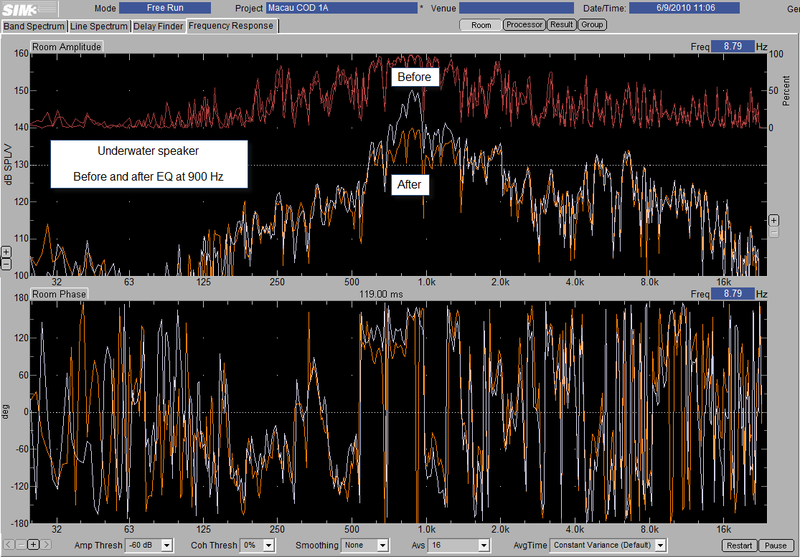 You can see a before and after eq screen shot here. I turned off the coherence blanking to help see the extent of the damage these reflections threw at us. THe phase response looks so mangled you might thing we set the delayfinder wrong – but no. It it is right………….for the 1st arrival at least, just not so right for the 2nd, 3rd, 4th, 5th,………. Interesting, though was the fact that, in spite of all the reflections, the basic tonal shape was quite consistent. Consistently bad, but consistently similar to the manufacturer’s data sheet. Concistent means we can EQ and get some positive effect. Really like the section about measuring under water.